I was recently enormously honoured to be asked to be Godmother to the delightful youngest daughter of one of my best friends. Said daughter is 4-years old, though, so a sterling silver rattle hardly seems the most appropriate gift to bestow on her. A white, leather-bound Bible, designed to be looked at but never read – another popular Christening gift – also strikes me as less-than ideal. 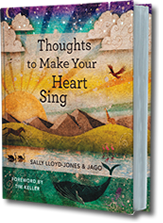 So I was delighted to see a blog post by Mark Meynell about the new book from Sally Lloyd-Jones and Jago, creators of The Jesus Storybook Bible (which does make a beautiful Christening gift). That, I thought, would make the perfect gift – useful, inspiring, but beautiful enough to keep forever. The book is called Thoughts to Make Your Heart Sing and is described by Tim Keller as possibly “the best first introduction for children to have their own time with Jesus.” It also makes a nice, simple but often profound devotional for adults, too. Look at this page, for instance. There’s a lot of depth in there, if you care to ponder it, yet it is summed up in just a few short sentences, and accompanied by a beautiful image – something for the 4-year-old to enjoy until she’s old enough to read the words for herself. When I showed the book to my parents, they both found the pictures ‘a bit strange’, and I agree they’re not to everyone’s taste, but I love their richness and vibrancy – they’ll appeal to children, but without being childish. The book also quotes a number of theologians and writers from throughout church history, and while I think this is brilliant and a wonderful thing to do, I was disappointed that the works referred to were not properly referenced. There is a section at the back of the book with some references, and other similar materials which had shaped Sally Lloyd-Jones’ thinking, but it doesn’t cover everything, which is a shame. Even worse, is that she often refers to different Bible Stories with no reference to help the curious reader find out more, which I think is a serious weakness – if you’re trying to spark someone’s interest in reading the Bible for themselves, make it easy for them to find the parts you’ve drawn them in with. That said, I still think this is a beautiful book, and I shall be sending it to my Goddaughter just as soon as I’ve finished reading it. I hope she and her family will love it and cherish it for years to come – and more importantly, that it will be another paving stone in the path that leads her to a relationship with Jesus. ‘…and I shall be sending it to my Goddaughter just as soon as I’ve finished reading it.’ So, you think it’s acceptable to send your Goddaughter a secondhand book? Absolutely. I love secondhand books – often more than brand new ones! That’s another love I hope to be able to instill in her over the years! !